Body Attack Protein Choc`N Dip is a protein rich snack - delicious hazelnut cocoa cream dip with 13 crispy bread sticks. This snack is the ideal companion when on the go - whether in the cinema, at the open-air event, in the office or during sports. The small snack box fits perfectly in every hand and sports bag. 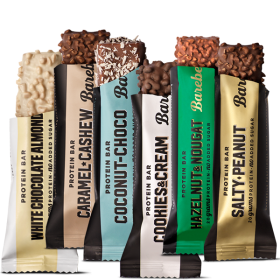 The Body Attack Protein Choc`N Dip is a tasty alternative to protein bars or protein spreads. The special feature of this snack is the added high quality whey protein concentrate, which provides 18 g of protein per 100 g and is a source of 8 essential amino acids that help maintain and build muscle mass. With 3.2g of sugar per serving (52g), this snack contains significantly less sugar than conventional similar snacks containing about 22g of sugar per serving. With the addition of maltitol, a low-calorie sweetener, the Body Attack Protein Choc`N Dip Snack not only impresses with its sweet taste, but also has up to 10 times less sugar than conventional dip snacks. Normal snacks often contain more than 30 grams of carbohydrates per serving, while the Body Attack Choc`N Dip contains 22 grams of carbs per serving. Especially people who have hard time building muscle mass and body mass can put the Body Attack Protein Choc`N Dip on their menu and use it as an alternative to gainer or energy bar. The snack is not only suitable for people who want to gain body weight and muscle mass, but also for figure-conscious individuals who are looking for an alternative to sugar-rich snacks. Since palm oil is very criticized, consumers are paying more and more attention to palm-free products. Therefore, this snack is ideal for people who want to avoid palm oil. The Body Attack Protein Choc`N Dip Snack has more to offer than top nutritional value, with high-quality ingredients such as 8% hazelnuts and 5% cocoa powder. Instead of palm oil, coconut oil, cocoa butter and sunflower oil have been used for this recipe. The delicious taste is rounded with natural vanilla flavor. Hazelnut-cocoa spread: sweetener (maltitol), whey protein concentrate, sunflower oil, hazelnuts (8,2%), sweet whey powder, highly de-oiled cocoa powder (4,8%), cocoa butter, coconut oil, emulsifier (lecithin), natural flavouring (vanilla). Breadsticks: wheat flour, sunflower oil, salt, barley malt extract, malted wheat flour, yeast. Allergen info: May contain almonds and soy.